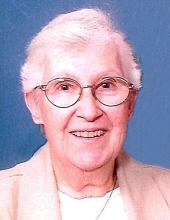 God called our sweet mother, Patricia Anne Hinn, 87, of Fond du Lac, to her heavenly home on Wednesday, February 6, 2019. She is now resting in the everlasting arms of Jesus. She is finally reunited with her loving husband Ervin, her beloved son Michael and other loved ones who went home before her. Pat was born on November 11, 1931 to the late Lawrence and Sylvia (Nehmer) Sage in Fond du Lac. She grew up in Fond du Lac and attended St. Joseph’s Grade School & L.P. Goodrich High School, where she graduated in 1949. She then went on to Marian College where she earned her teaching degree in 1953. She taught at Cooper Elementary School in Sheboygan from fall of 1953 until June of 1955. It was there that she met Patricia Malone, and thus began the life long friendship of “Sagie and Malone”! In 1954, Pat traveled all over Europe for three months visiting friends. She then taught at Elizabeth Waters in Fond du Lac until her marriage. On June 16, 1956 Pat married Ervin Roy Hinn at St. Joseph Church, Fond du Lac. Erv preceded her in death on April 12, 2014. Pat & Erv started their family. She was a homemaker most of her life. She enjoyed knitting, watching classic movies, sewing and crafted over 200 baptismal blankets and prayer shawls for Presentation Parish. She also quilted for Mary’s Helping Hands. Pat was also very proud of her Irish heritage. She is survived by six children, Peter (Jo Ann) Hinn, Susan (Patrick) McManus, Tracy Merwin, Larry (Special Friend, Nancy) Hinn, Barbara (Ted) Kielb, all of Fond du Lac and Mary Jo (Jim) Pfeiffer of Waupun; one daughter-in-law, Lisa Hinn of Kearney, MO; grandchildren, Eric Hinn, Matthew (Special Friend, Amber) Johannes, Yvonne (Scott) LaShay, Renee (Mark) Pasewald, Allison Hinn and Evan Merwin and great-grandchildren, Louise and twins, Ben and Maggie Pasewald. Pat is further survived by a sister, Rita Sage Bono; brothers and sisters in-law, Robert (Edith) Hinn, Patricia Johnson, Janet Halverson, Andrea Roach and Kathy Hinn; many nieces, nephews, other relatives and friends. Preceding Pat in death is her husband Erv, her parents, one son, Michael Hinn, two grandchildren, parents-in-law, Ervin H. and Violet Hinn, sister, Lorna (Robert) Malouff, brothers-in-law, Earl Johnson, Donald Halverson, James Roach, Ralph Hinn and David Hinn; sisters-in-law, Carol Hinn and Kathy Hinn. Visitation: The family will receive relatives and friends on Monday, February 11, 2019 at Presentation Church, 705 Michigan Avenue, North Fond du Lac, from 9:30 AM until 10:45 AM. Service: At 11:00 AM at Presentation Church on Monday, February 11, a Mass of Christian Burial will be celebrated. Burial will follow at Calvary Cemetery, Fond du Lac. The family extends a special thanks to the 5 West staff at St. Agnes Hospital for their care for Patricia. And also want to thank Debbie Goeser for her help for caring for her grand dog, Panda.Memorials can be directed to Presentation Parish. "Email Address" would like to share the life celebration of Patricia A. Hinn. Click on the "link" to go to share a favorite memory or leave a condolence message for the family.